My Mission is SUP Fishing. That is how I do my fishing! HomeBoatsToGo - Blog About Inflatable Boats, Inflatable Rafts, Inflatable Kayaks And More...My Mission is SUP Fishing. That is how I do my fishing! Two of my life's biggest pleasures are standup paddle boarding and fishing. I take both extremely seriously, which means I do plenty of research before I decide to buy any fishing boat or SUP. I want something that is convenient, heavy-duty so it will last a long time, maneuverable, and durable. As far as convenience is concerned, I long ago decided to go with an inflatable boat for my fishing vessel. But I always had a separate stand up paddle board that took up space in my home. That was until I started searching around on BoatsToGo.com a couple years ago and found a vessel that met and exceeded all of my needs. That vessel was the PRO Angler Fishing Extra Heavy-Duty Inflatable SUP from Saturn. The first thing that caught my eye was that this particular inflatable stand up paddleboard was designed to be military grade. That means they are able to take a licking and keep on ticking. Considered by many to be the most durable inflatable stand up paddle board available today, the PRO Angler SUP is made of extra strong 6” thick drop-stitch fabric. Saturn has also coated the bottom and top of this inflatable SUP with an extra 1.5mm PVC layer, which helps make this vessel insanely resistant to rips and abrasions. Simply put, this boat is designed for war. Performance-wise, the PRO-Angler inflatable SUP is right at the top of the heap. Its 35” wide body design allows for 30% more air volume, which results in much higher performance under heavy weight loads. This is perfect for my other hobby of fishing, because this inflatable paddle board can easily hold the weight of all of my gear without its performance suffering. Plus, the perfectly placed grommet lines on both sides of the vessel make strapping my fishing gear down extremely convenient. But what if I want to spend a more relaxing day out fishing on my inflatable SUP? That’s no problem at all, because this inflatable stand up paddle board doubles as a sit-on-top kayak just by easily attaching a simple kayak seat. When I read that, I knew this vessel would be the perfect tool for my two favorite hobbies. I haven’t even mentioned some of the other incredible conveniences of my PRO Angler Fishing Extra Heavy-Duty Inflatable SUP from Saturn yet. For starters, this vessel is very easily inflated with the included hand pump, and then deflated when not in use. Because of this, it can be easily transported and stored in small spaces. That means no more docking fees for your fishing boat, roof rack for your stand up paddle board, or cramped garage. And maybe best of all, BoatsToGo now has this inflatable stand up paddle board on sale for only $849, so you won’t have to blow months and months of salary on your new boat. 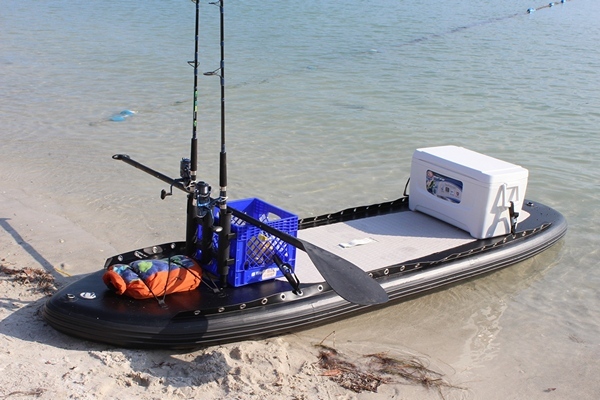 So if your mission is SUP fishing, check out the Saturn PRO Angler Fishing Extra Heavy-Duty Inflatable SUP on BoatsToGo.com, and you can tackle these two great hobbies of fishing and stand up paddle boarding with just one vessel!